Sharing God’s love and faithfulness with women in their transition through the court system to recovery, restoration of families and productive living in the community. Beginning in the fall of 2008, I began working as a volunteer with the chaplain at the Atlanta City Detention Center. My first day of teaching bible study at the jail changed my life forever. I was overwhelmed by the “flood” of compassion and love that filled my heart. Each and every woman in that place seemed beautiful, even though their lives were filled with shame, hopelessnes and despair. I discovered that 99 percent of the inmates were addicted to crack cocaine and in a cycle of being arrested over and over again. 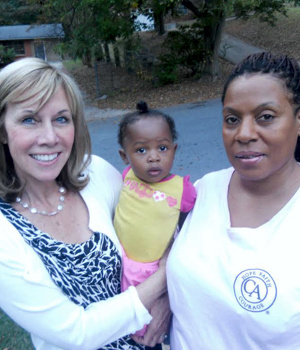 To my disbelief, these women were released from jail back out on the streets of Atlanta with nothing… no clothes, no phone, no money, no ID… and most of all, no family. I was determined to find a way to assist these women in finding substance abuse recovery programs. I waited in my car outside the jail for the women to be released. I waited in courtrooms. I was fearless, unstoppable, and for five years I worked all alone… all day and all night… in the most dangerous neighborhoods in our city. I felt empowered by the grace of God, even though I had no credentials. I was not an ordained minister, or even a social worker. I never even had a plan. I just did the work. As I look back, I often wonder if I related to their pain. My life was out of control too. I was living through the devastation of my own beautiful daughter's struggle with the same issues. I am convinced, without a doubt, that God used my brokenness and my pain for His glory. I also discovered that just “being there” and caring made a difference in the lives of these women. God gave me the peace and discernment to quietly and patiently do what was needed in order to advocate for their recovery. I saw potential in each and every one and believed that change in one person’s life will affect change in lives of families for generations to come. And I never gave up, because I witnessed first hand all that God was doing to heal these women… body, mind and spirit. Prayerfully consider helping us serve the special needs of women in recovery.